This beauty is a special opportunity for the discerning buyer. Affordable, comfortable and convenient, a condo nestled in the palm trees. NEWLY REMODELED: stainless steel appliances, wood cabinets, granite counter top, laminate flooring, overhead lighting. 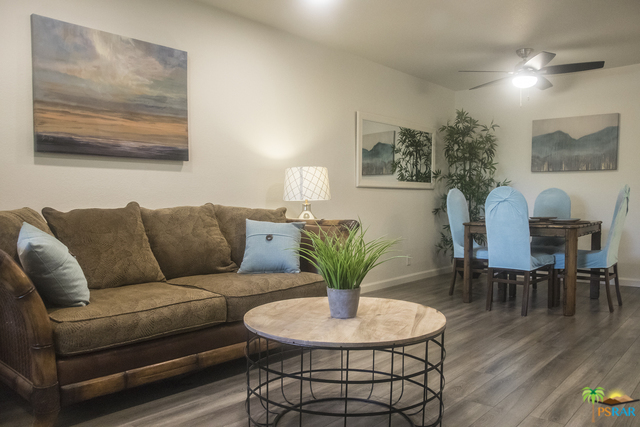 UPPER PARTIAL CORNER UNIT: quiet and private.This unit is move-in ready for the first time buyer, as a second home, or for short or long-term rental. Villas I offers great amenities-lusciously landscaped grounds, pools, spas, and tennis courts in a truly parklike setting. The view from your private deck embraces the grounds and sparkling pool. And you are just minutes from downtown shops and restaurants. Come tour this beautiful property and imagine yourself living the Palm Springs life! !